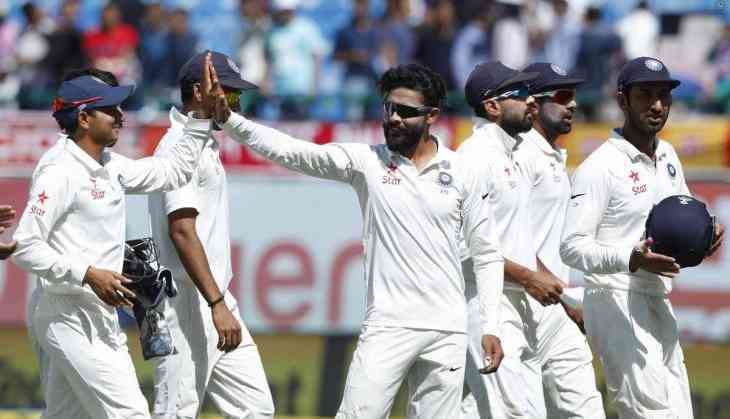 In a major blow to Team India, all-rounder Ravindra Jadeja was on Sunday suspended for the third and the final Test against Sri Lanka after accumulating six demerit points over a 24 month period. During the third day's play in the Colombo Test against Sri Lanka on Saturday, Jadeja was found guilty of breaching ICC Code of Conduct which relates to "throwing a ball" in a "dangerous manner" during an International Match. Saturday's incident happened on the final delivery of the 58th over when Jadeja, after fielding off his own bowling, threw the ball back at the batsman who had not left his crease. The on-field umpires deemed the throwing "in a dangerous manner" as it narrowly missed Dimuth Karunaratne. The left-handed, who had received a 50 percent fine and three demerit points during the Indore Test against New Zealand in October 2016 for violating the code, with the addition of Saturday's three demerit points, reached the threshold of four demerit points. As a result, the 28-year-old has been suspended from the Pallekele Test beginning August 12. India registered a comprehensive win against Sri Lanka in the Colombo Test and took an unassailable 2-0 lead in the three-match series. Jadeja, the no. 1 ranked bowler and all-rounder in the world, was the pick of the Indian bowlers as he scalped yet another five-wicket ball. The left-hander was adjudged Man of the Match for his match figures of 7-236 in 61 overs apart from unbeaten 70 with the bat in the first innings.